The veterinary office can be a frightening destination for many dogs, but it doesn’t have to be. One way to reduce your dog’s stress is to ask your dog to do some simple tricks during his visit. This can help keep him calm and focused. Choose tricks that your dog is confident and comfortable performing, and be sure to practice them ahead of time so that your dog is used to the commands and knows what is expected of him. And always provide lots of rewards and positive reinforcement! It’s important to note, though, that this approach may not work with all dogs; some canines may be too anxious to respond constructively. Strong emotional reactions, including fear or panic, can interfere with a dog’s ability to respond to familiar commands. If your dog is too anxious to participate, or if he has trouble remaining calm, talk to your veterinarian about other options. Go to your mat: A mat can act as a type of security blanket for your dog; it provides a familiar, safe space for your pooch during his visit. A mat gives your dog a place to relax while you wait for the vet. Productive chews, food puzzles, or dropped treats can help keep your dog on his mat. In the exam room, a mat can give your dog’s paws grip and stability on potentially slippery surfaces, like the floor, scale and exam table. A dog who is trained to go to his mat may be more willing to move onto these spaces at the vet’s office. Mats with a nonslip bottom are ideal. Puppy pushups: This combination of tricks — sit, down, stand — can be used to get your dog to rest, when needed. Puppy pushups can also help keep him stationary while he’s on the scale or table. Ask the staff to interact with your dog by giving him one of the basic cues — sit, down, stand — followed by a treat (or two). This is an easy way to teach your dog to associate good things with the veterinary staff. Shake: Ask your dog to greet the vet or his staff with a shake; this helps your pooch establish a comfortable, familiar relationship with them. Shake is also an easy way to get your dog to willingly offer his paw for nail trims or for an examination of the paw and leg area, and it can help your dog feel more comfortable having his paws handled. Beg: Another command that makes for easier exams is beg or sit pretty. A dog’s chest and abdomen are often examined to ensure that the skin looks healthy, or for other reasons. Asking your dog to lift himself up into a beg position may allow the veterinarian to more easily assess your pet without needing to physically move the dog onto his side or back. Wait: When you tell your dog to wait, this means that he is to remain in place until he is released; most often this is handy at the front door or while his food is being served. At the vet’s office, the wait command can be used to hold your dog still while he is being examined. Practice at home with your dog, beginning with light, brief touches and building up to handling that is more akin to a vet visit. When you release your dog, be sure to reward him immediately. Eye contact: The watch me command can be useful if you need to hold your dog’s attention — in the waiting room while surrounded by other animals, for example. The watch me command can also be a good way to keep your dog calm and focused during different parts of an exam, such as an ear evaluation. In addition, the staff may need to look your dog in the eye during his visit. 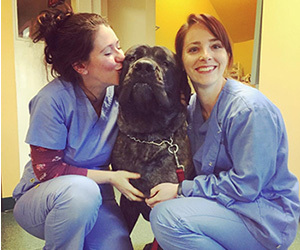 Teaching your dog to make eye contact on cue can increase his comfort in this situation and reduce the possibility that he will perceive the veterinarian and staff as a threat.